We continue our Presidential Geography series, a one-by-one examination of the peculiarities that drive the politics in all 50 states and the District of Columbia. Here is a look at Kansas, the Sunflower State. FiveThirtyEight spoke with Joseph A. Aistrup, a professor of political science at Kansas State University; Burdett A. Loomis, a professor of political science at Kansas University; H. Edward Flentje, a professor in Wichita State University’s Hugo Wall School of Urban and Public Affairs; and David Kensinger, president of Roadmap Solutions, Gov. Sam Brownback’s policy organization. A long tradition of centrist Republicanism in Kansas — exemplified by politicians like former Senator Bob Dole and former Gov. Bill Graves — was dealt a near-fatal wound last month when a group of state senators, deemed insufficiently conservative, were defeated in Republican primaries. Kansas had been a reliably conservative state for years, and Mitt Romney is all but guaranteed the state’s six electoral votes. 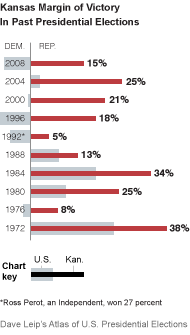 But until recently, Kansans still preferred a government far from the ideological poles. “A moderate coalition ran the state for 40 years,” Mr. Loomis said. That era appears to be over. The primaries were the culmination of a gradual, two-decade drift to the political right in Kansas, but they also came after several years of faster-paced conservative ascension, as well-financed interest groups capitalized on a backlash against President Obama and his policies, local political analysts said. Unless Democrats are able to pull off upsets in the November general elections, the victories of the less-centrist Republican candidates will clear the way for a more conservative vision of the state. Long-sought conservative legislation on issues including health care, the selection of judges and environmental regulations is expected to become law. In 2010, the Tea Party movement that swept conservatives into power nationally helped Kansas conservatives to extend their influence. The state’s Democratic governor was replaced by a conservative Republican, Sam Brownback, and the G.O.P. expanded its majority in the State House of Representatives. Only the Kansas State Senate retained significant centrist tendencies, and several of Mr. Brownback’s legislative goals were stymied by a coalition of Democratic and moderate Republican senators. That conflict set up the recent “moderate” vs. “conservative” Republican primaries. And the conservatives, backed by Mr. Brownback and an avalanche of outside money, won. Americans for Prosperity, financed by the Wichita-based Koch brothers; the Kansas Chamber of Commerce, who also received a large Koch check; and other groups spent hundreds of thousands of dollars during the campaign. But the rightward lurches last month and in 2010 were made possible by a longer term shift in the state’s political landscape. Over the past two decades, Kansas’ Republican Party has become more conservative, particularly in two of the state’s main population centers: Wichita’s Sedgwick County and the Kansas City suburbs in Johnson County. In presidential elections, there are just two truly Democratic counties remaining in the state: Wyandotte County and Douglas County. Wyandotte County is home to blue-collar Kansas City, Kan., sometimes abbreviated as K.C.K., a traditional Democratic city with large minority populations. Democrats are also dominant in Douglas County, home to the University of Kansas in Lawrence. The rest of Kansas is heavily Republican. There are counties where Democrats keep the vote close, mostly the suburban counties around K.C.K. But in this case, close means a Republican margin of victory of around 10 percentage points. Republican voters in the fast-growing suburbs of Johnson County tend to be more conservative than the typical suburban Republican in other states. And voters in Kansas tend to get more conservative as you travel away from the state’s population centers. The deeply religious farm counties in western Kansas are among the most conservative counties in the nation. In 2008, Senator John McCain, of Arizona, won more than 70 percent of the vote in most of them. In the southwest, the flat land is dotted by dairy farms and slaughterhouses (Dodge City, Garden City and Liberal are known as the “Golden Triangle of meatpacking”). Meatpacking plants have attracted an influx of Latino workers, and in many rural schools a majority of students are Hispanic. But the state’s growing Latino community has yet to have an appreciable effect at the ballot box. Kansas’ rightward shift is perhaps best exemplified by Wichita’s Sedgewick County, where Democrats used to be a majority. Wichita, home to some of the biggest airplane manufacturers in the nation, is mostly Republican, partly because residents from more rural parts of the state have resettled there, Mr. Loomis said. It has transformed into a good political bellwether, coming within one percentage point of the statewide vote in the last three elections. The shift to the right in Kansas is unlikely to be reversed in the near future, especially in presidential elections. Mr. Romney has a 100 percent chance of carrying the state, according to the current FiveThirtyEight forecast. Democratic comeback on the state level is possible, the local analysts said, particularly if the new governing coalition overreaches. In addition, the state’s shift to the right was, at least in part, a reaction to Mr. Obama, who will be president for a finite amount of time (either 124 or 1,584 more days). Outside interest groups like Americans for Prosperity were able to capitalize on those anti-Obama feelings, tying moderates to the administration. With the elimination of those moderate Republican senators, the more conservative wing of the Kansas G.O.P. will have a largely unobstructed path to implement its vision. “You’re going to see durable conservative majority governing Kansas for the foreseeable future,” Mr. Kensinger said.